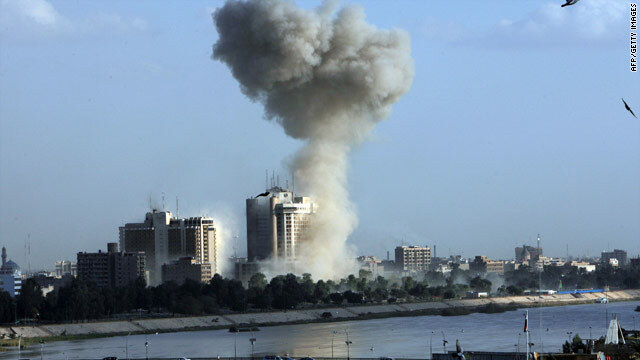 Smoke rises Monday following an explosion near Baghdad's Palestine Hotel. Baghdad, Iraq (CNN) -- At least 36 people were killed and 71 hurt Monday in three vehicle bombings that rocked Baghdad, an Iraqi Interior Ministry official said. The blasts targeted hotels in central Baghdad. The three explosions happened in quick succession near the Palestine, Babil and Al-Hamrra hotels, the Iraqi official said. Some news organizations have offices in the Palestine and Al-Hamrra hotels.